Discover a prayer to cover every aspect of rural life. Anglican priest, Bill Bennett understands the complexity of rural life and its deep dependence on seasonal life. His 117 prayers are arranged into broad themes: the seasons, environment, community, mission and ministry, work,... read full description below. Discover a prayer to cover every aspect of rural life. A musician and composer of many hymns, Anglican priest Bill Bennett understands the complexity of rural life with its overlapping communities and its deep dependence on seasonal life. This understanding shines through this book. 117 prayers are arranged into broad themes: the seasons, environment, community, mission and ministry, work, crisis and loss. There are also six sets of Eucharist liturgies and another five liturgies focused on the bush, harvest community life and adverse events. This book will be a valued resource for both clergy and lay worship leaders. These liturgical resources will touch everyone who is interested in seasonal joy and struggle, planting and harvest, whitebaiting and hospitality. A theology of land and missional ministry that is shaped by both local life and God's call, with a deep understanding of tikanga Maori, mean that these prayers and reflections are uniquely and wonderfully New Zealand. I commend them to you and hope they are widely used across the country. They are for us all. From the Foreword by Rev Dr Jenny Dawson. These liturgical resources will touch everyone who is interested in seasonal joy and struggle, planting and harvest, whitebaiting and hospitality. A theology of land and missional ministry that is shaped by both local life and God's call, with a deep understanding of tikanga Maori, mean that these prayers and reflections are uniquely and wonderfully New Zealand. I commend them to you and hope they are widely used across the country. They are for us all. From the Foreword by Rev Dr Jenny Dawson. Bill Bennett comes from a Southern Hawke's Bay farming background. He has served much of his ministry as an Anglican priest in rural parishes in the Diocese of Waiapu as well as in the Norwich and Lichfield Dioceses in England. He worked as Ministry Enabler and twice as Regional Dean in Hawke's Bay between 1994 and 2015. 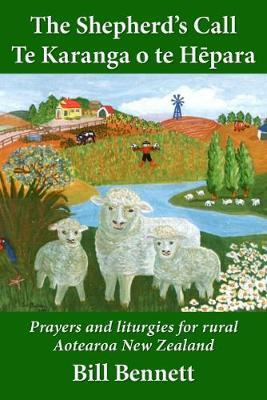 His interest in rural communities is reflected in his publications: God of the Whenua (an overview of rural ministry in New Zealand), Seasons of the Land and The Shepherd's Call (both being prayers and liturgies for rural communities). He continues to write hymns and songs (words and music). He is on the Editorial Board of the international periodical, Rural Theology. Till its demise recently he was tutor in Rural Ministry Studies for the Ecumenical Institute for Distance Theological Studies (EIDTS). He and his wife Wendy live in retirement in Napier, New Zealand.